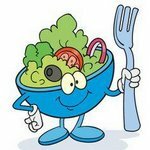 Lanett Junior High School: Highlights - Salads Now Available for Student Lunch! Salads Now Available for Student Lunch! ALL students, faculty, and staff can pre-order a salad, instead of the regular menu offering. The salad will include lettuce, tomatoes, meat, shredded cheese, salad toppings, salad crackers, fruit, a choice of salad dressing, and milk. In order to enjoy this lunch option, you MUST Pre-Order! Complete a salad order form and turn in your form before the end of HOMEROOM. No late orders will be taken.